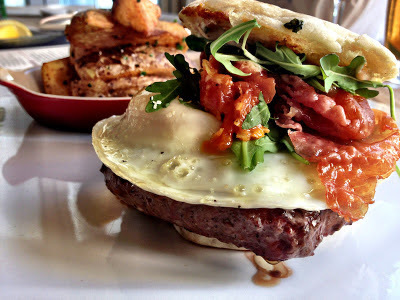 We’re fans of Coal Burger, the Arizona-based burger chain from the Grimaldi’s Pizza folks. 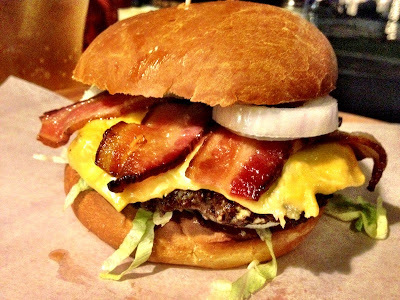 Their Woodlands Waterway location is the first store outside of Arizona, and we think they serve an excellent burger. But we’ve heard reports of some less-than-spectacular burgers being served. The culprit is overcooked beef. But the mastermind behind Coal Burger, Chef Bradford Thompson, has devised a simple solution to the problem. The original Coal Burger was architected around a quarter-pound patty. The half-pound burger was simply two of these patties, stacked up. The good news is that there is plenty of exposed surface to hold an aggressive char. The downside is that the interior of the burger gets hot quickly, and unless the cooking is perfectly timed, all the juices evaporate in the intense heat of the coal-fired oven (over 1000 degrees.) A juicy Coal Burger is a superlative burger, a dry one loses a good deal of its appeal. So how do you keep the patty from drying out as it cooks and develops that wonderful char? The solution is an elegantly simple one: Enlarge the patty. The petite quarter-pound patty is now a thicker third-pound patty, and the larger mass of beef holds up better to the intense heat, holding in the juices with aplomb. Patrons preferring a larger burger now get their half-pound of beef in a single patty. After learning about this clever solution, we wanted to grab a table and sample the result. This led to discovering the other big change at Coal Burger – table service in the evenings. 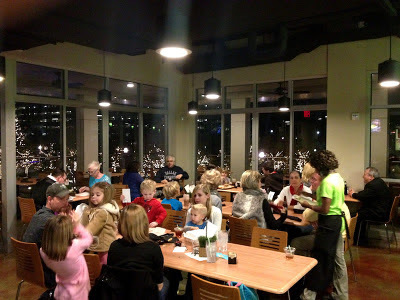 A hostess, plenty of waiters and tables dressed with silverware and cloth napkins contribute to the decidedly upscale atmosphere; the view overlooking the sparkling lights of Waterway Square completes the setting. We found the idea of table service to be pretty unique for a burger joint, albeit a high-end one occupying prime real estate in the Woodlands. Coal Burger’s staff made it work well; waiters are friendly, service is good, and the result makes for a great date night experience. So how was the burger? In short, it’s the bacon cheeseburger of backyard dreams, but now with a thicker, beefier, jucier patty. High quality cheese (American for us.) Thick cut, smoky bacon. Fresh veggies. And that’s a win in my book. We like the changes at Coal Burger, and applaud the attention of Chef Bradford and his staff to refining a great burger experience and making it even better. Coal Burger is always my favorite place when I was in Arizona. I really don't believe whatever said against the restaurant.